NOTE: This article is out-of-date and I am planning on correcting it and developing a jarvis like software, if you are interested in this and would like it to be created then please comment below or subscribe to the email list to be notified when its done. If your an Iron-Man fan or a total geek like myself then I am sure you have thought about running j.A.R.V.I.S on your PC, forget Siri, Cortana or even Google Now when you can have your own customised voice assistant for your PC. While many voice assistants require the internet and only perform functions such as finding the weather or searching for stuff online. While these features may be handy they don’t offer advanced functionality such as running scripts or launching tasks etc. In this tutorial we will explore a simple way to setup a J.A.R.V.I.S like assistant that you can use on your PC, of course this won’t be as awesome as the real J.A.R.V.I.S on Iron Man but will offer some cool functionality. To get started begin by downloading the software from LINKS after installing the previous packages from Microsoft, you can choose from Mark II or Mark III, at the time of writing Mark III is in closed beta and will be available soon so we will use Mark II. Next up launch the program and follow all prompts to install the software onto your PC, it may prompt you to download other components mentioned above if yes then follow prompts to install those onto your computer. At this point you may also be prompted to select your sound source, this may include an external desktop microphone or perhaps a headset whichever one suits your PC choose it but make sure it is plugged in first. Now you can have some fun and go all out with scripts and custom voice commands, to maximize this it is recommended to have some knowledge in VB or Batch to create Windows scripts. If you are new to scripting don’t worry because it isn’t really hard, you can even search for many scripts and easily make them yourself. If you don’t want to mess with scripts you can set commands to open your favorite websites like Facebook or YouTube and even launch your favorite programs such as Chrome, Spotify or any other favorites. Once you are finished you may want to the set the program to start on boot to save you opening the program every time, to do this go to Start – All programs – Startup and right-click the folder and choose “open all users”. Now copy and paste the desktop shortcut into the folder and it will start on the next boot. Feel free to share your own scripts or ask for help if needed in the comments section below. 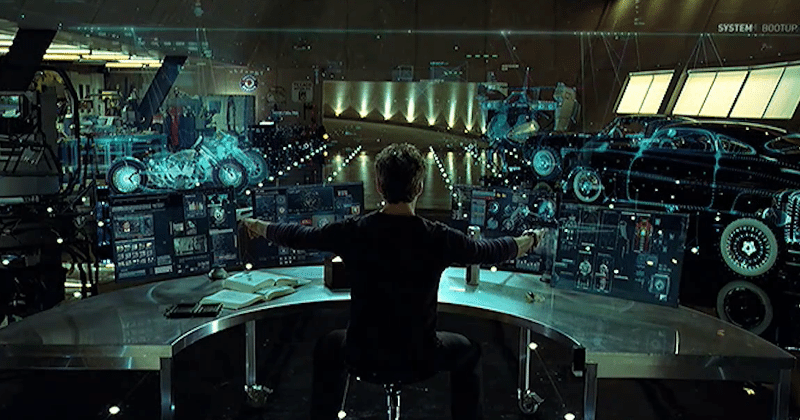 If you would like to complete the transformation and really make your PC look like J.A.R.V.I.S from Iron Man then there are some extra things your going to need to do. The first thing to do would be to install Rainmeter and the J.A.R.V.I.S theme, the theme can be installed by double-clicking the file after Rainmeter is installed onto the computer. Now just follow the prompts and you should immediately see a selection of widgets on your desktop click and drag the widget to the desired location, any widgets that you don’t want can easily be removed by right clicking and choosing “unload”. You can also go in and apply an HD wallpaper to fit the theme of your new desktop. However there is still one problem, the voice by default Windows will revert to the default sounds for it’s AI which in my opinion sounds horrible, unfortunately the only working method to get the Jarvis voice is through a paid program called Ivona and a separate module called “Brian UK voice”. Despite the program being paid you may be able to acquire a free trial which should work indefinitely. That’s it now you can ditch Siri, Cortana and other voice assistants and stand out from the crowd with your own personalized J.A.R.V.I.S system! Hi, currently working on a replacement software which will be similar. Feel free to join the email newsletter to get notified when its released. I know its been a while but definitely going to update this article soon. Got a slight problem. The program will not launch, so either I missed installing something, or I need to alter my settings. My entire PC is in Swedish Language, do I need to set everything to English? It also did seem unable to find my microphone which is part of a USB headset. Here is the log data. Check if you have supported language installed. Check if your default microphone is not mute or disabled. Hey very cool web site!! Guy .. Beautiful .. Amazing .. I will bookmark your website and take the feeds alsoKI’m glad to find so many helpful information right here within the publish, we want develop extra techniques on this regard, thank you for sharing. . . . . .